There is a story of the English artist JMW Turner putting his head out a train window only to have a crowd of passengers pull him back in, concerned the 45-mile-per-hour speeds would cause irreversible brain damage. Shortly afterwards, Turner painted his masterpiece Rain, Steam, and Speed (1844), an image of the newly invented steam engine passing through the English countryside on the brink of the Industrial Revolution. For nineteenth-century Europeans, the image distilled both the exhilaration that comes with progress and the concern that tradition would precipitously fade. Today there is perhaps no better example of this dichotomy between the old and the new than in China, which is undergoing its own Industrial Revolution. 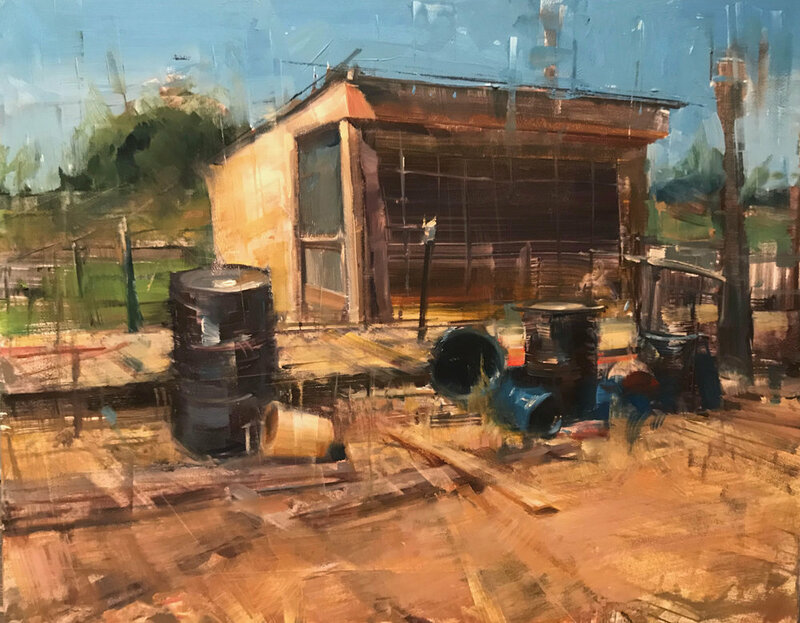 That is where Bryan Mark Taylor, one the foremost plein-air painters of his generation, traveled to Guangzhou to capture vanishing landscapes of traditional life. JMW Turner (British, 1775-1851) Rain, Steam, and Speed — The Great Western Railway (1844) Oil on canvas. 36 x 48 in. National Gallery, London. The Chinese call Guangzhou, home to more than 44 million people, the “Third Capitol of the World.” For more than 2,200 years it has been a center of international trade. The region is bisected by the Pearl River. In ancient times it carried porcelain and silk to the ocean. Today, it is the central hub for exporting China’s hegemonic manufacturing output around the world. Much like Europe and America in the nineteenth centuries, China is going through a period of dramatic change. Entire ancient cities are vacated to make way for highways, electrical grids, and skyscrapers. The result is not only a leap forward in the wealth and education of many citizens; but, for others, displacement and the loss of traditional culture. This is particularly true for the indigenous Tanka people, who live and fish along the shores of the Pearl River; increasingly under the shadows of skyscrapers. Having traveled around the world to paint what he calls “Nature’s everyday miracles,” Taylor saw this trip to China as a significant opportunity. “As someone who is both a student of tradition and who embraces technology, I found myself drawn to China and the Tanka in particular. I wanted to show the juxtaposition of old and new.” Taylor is widely considered among today’s leading landscape painters. A long-time teacher and lecturer at the Academy of Art University (San Francisco), he has taught courses at Pixar and has been a featured speaker for the Plein Air and CTNX conventions. Taylor’s works have won numerous awards and been celebrated in Fine Art Connoisseur, Plein Air, Southwest, and American Art Collector magazines. Much like Turner in his time, Taylor is considered an innovator rooted in tradition. Bryan Mark Taylor. Datang Twilight (2017) 18 x 24 in. Oil on Panel. Taylor is a plein-air painter, taking his easel into the open fields of the Western United States to observe and paint nature directly. This tradition of plein air dates to the early nineteenth century, the era of JWM Tuner. Before then, the limitations of oil paints drying out meant that artists would create studies from nature and finish works indoors, resulting in scenes that were often beautiful but dramatically removed from their original subjects. Turner was among the first to adopt new technologies of metal tubes for transporting oil paints, setting his easel in the outdoors to paint in his signature vigorous, bold strokes. Nearly two hundred years later, Taylor has observed that tools used for plein-air have remained relatively unchanged since Turner’s time. According to Taylor, “The same kits used by English and French artists in the mid-nineteenth century can still be found in most art supply stores, un-affected by dramatic leaps in materials and methods that have taken place since.” To remedy the gap, he has invented and manufactured a new set of tools under the name of STRADA that are being widely adopted in the plein-air community and beyond. Bryan Mark Taylor Plein-Air Painting on the Shores of the Pearl River. While Taylor and Turner may share a similar interest in new technologies and cultural shifts, at least in this case, their perspectives differ. Whereas Turner painted Rain, Steam, and Speed (1844) from the perspective from the train, looking down on the villagers at a distance, Taylor has adopted the perspective of the villagers. Bryan Mark Taylor. Tanka House Boat (2017) Oil on panel. 11 x 14 in. Where there were once tens of thousands of Tanka people, now there are only hundreds. In a recent article in the New York Times (here), Tam Wing-Keung, a local Tanka fisherman summed up the their current miasma: “Before, we could sing [to our children] the saltwater songs of our people, but very few people know them now — I don’t.” Some estimate that within fifteen years, the Tanka way of life — their fishing villages and open-air markets — will have vanished; with a new generation of Tanka children assimilated into modern, Chinese culture. Bryan Mark Taylor. Guangzhou Skyline (2017) Oil on panel. 11 x 14 in. In this way, Taylor’s paintings are not only an expression of his skills; but, perhaps more importantly, documentation of a vanishing landscape. And, rather than focus on the encroaching change, his works are full of hope, focusing on the dignity of Tanka life. Boats, where people live and work out their days are painted in bright colors. Bryan Mark Taylor. 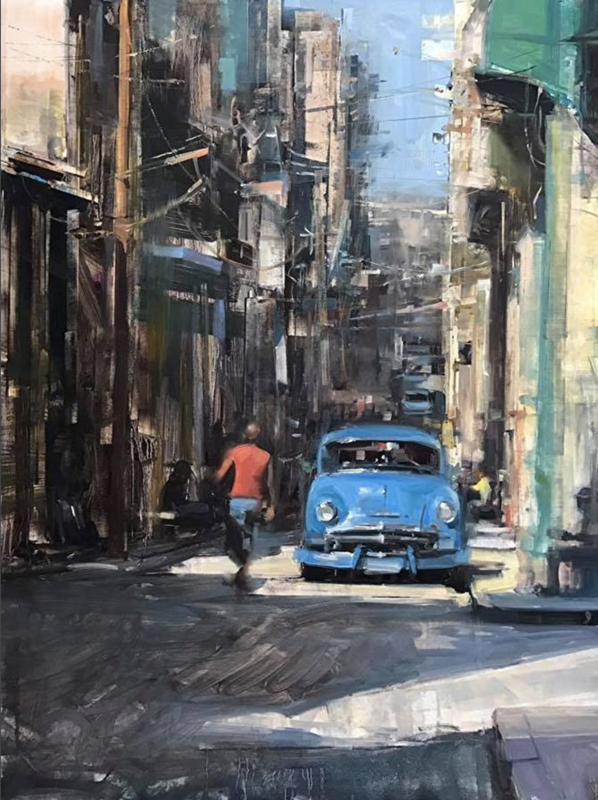 Havana Classic (2016) Oil on panel. Although featured heavily in his most recent group of paintings, the Tanka are only part of a persistent theme for Taylor. Earlier this year, he travelled to Cuba. There, Taylor painted the old cars and faded pastel buildings synonymous with Havana’s charm; but, likely to be replaced as the Communist government embraces new economic policies. Bryan Mark Taylor. Chicken Coup (2017) 11 x 14 in. Oil on panel. In his native Utah, with a reputation for natural wonders and five National Parks, Taylor has eschewed the typical subjects of red-rocks and high-mountain passes to document another kind of vanishing. Rural Utah was once thriving and productive; but, as the State develops a reputation for technology jobs, farms, mines, and factories are abandoned for major population centers. Whether in China, Cuba, or the rural Western United States, through the forces of technological advancement, government policy, or economic survival, our world is in dramatic flux. Occasionally, it helps to have someone, like Bryan Mark Taylor, place his head out of the window and capture a moment before it is gone. This essay was commissioned for Vanishing Landscapes, an exhibition of Bryan Mark Taylor’s most recent works from China, will be on view at Anthony’s Fine Art (401 E. 200 S., Salt Lake City | anthonysfineart.com) from December 1 to January 20.